What does AVERIL hope to achieve? 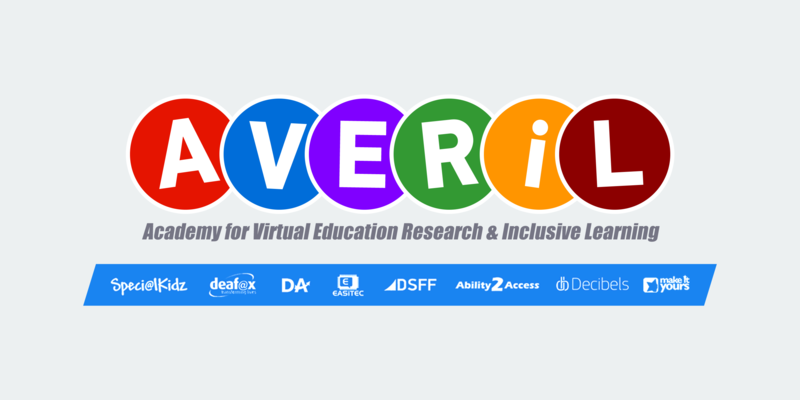 AVERIL aims to advance education, research and inclusive learning for people of all ages with a variety of disabilities associated with speech, language and communication using online video. What individuals are involved with AVERIL? The Honorary President of Deafax is Dr Vinton Cerf - widely recognised as the 'Architect of the Internet'. Vice-presidents from all the educational enterprises include Mastero Vladimir Ashkenazy, Dame Evelyn Glennie DBE, Malcolm Bruce MP, Dr Alan Hurwitz, Julua Kaufmann OBE, Graham Wallace, Lucy Woods, Eileen Uttley, Kate Bourne, Peter Johnson, Nicholas Purnell QC and Prof. Adam Ockelford. Who do we wish to join AVERIL? AVERIL will be networking with Schools for the Deaf, Hearing Support Units, Peripatetic Services, SEN (Special Educational Needs) Schools, Units and Clubs etc. throughout the UK and Internationally which provide facilities for children, young people and adults with deafness and other disabilities including aphasia, autism, deafblindness, dyslexia and dyspraxia. AVERIL is shared with other Educational Enterprises: Deafax, SpecialKidz, SpecialKidz International, Ability2Access, Deaf Sports & Football Foundation, Decibels, Deaf Aspirations, Deaf Aspirations International and EASiTEC.